About 711,736 families have taken to farming in Lagos State, Commissioner for Agriculture, Mr. Oluwatoyin Suarau said yesterday. The government, he said, had subsidised LAKE Rice with N1.049billion from December 2016 to date, as part of efforts to ensure food security in the state. The LAKE Rice, he said, was being sold at a highly subsidised rate of N12,000 per 50kg bags, adding that it has brought down the skyrocketing price of rice. “The state government has subsidised LAKE Rice under this review period with N1,049,140,395. 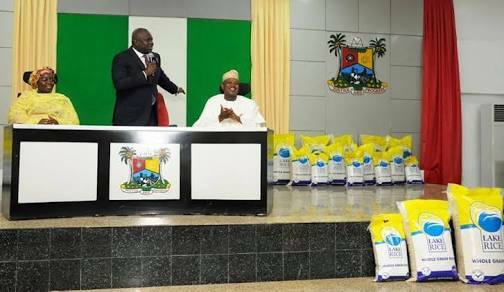 This is targeted towards ensuring food sustainability and food security in the state and as an end result, making Lake Rice a national brand,” he said. The government, he said, would establish a 32 tonnes per hour rice mill with AG (“Bühler”), a leading rice-mill producer in the world. “It is estimated that the partnership would facilitate the creation of 274,000 jobs across the agriculture value chain, and will also bring about the cultivation of 32,000 hectares of farm land to produce rice paddy, equating to an estimated 130million Kg of processed rice per year which is an equivalent of 2.6milion 50kg bags of rice,” he said. The commissioner said the establishment of the state-of-the-art rice mill would serve as a platform for Lagos to partner with other Southwest states.